Ree-Danielles Hotel is a 3-Star hotel located at No 6 Emmanuel high Street, Ogudu GRA, Ojota, Lagos. It is situated in a prominent part of the Lagos mainland. Ree-Danielles Hotel has an array of rooms on offer. 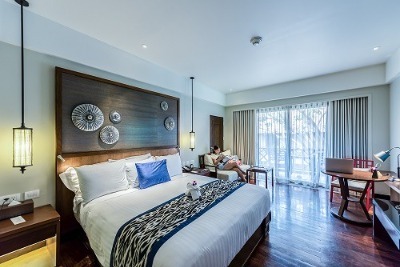 These rooms are grouped into Standard rooms, Deluxe rooms, Executive rooms and Business Suite. The rooms at Ree-Danielles Hotel are quite spacious and come with great services and facilities such as luxurious beds, wardrobe, flat-screen television sets with access to cable channels, free wireless internet access, en-suite bathrooms with stand-in showers and complimentary toiletries, telephone luggage storage, tables and armchairs, refrigerators plus in-room sofas. Ree-Danielles hotel also boasts high-class services like: uninterrupted electricity, an event hall, adequate car parking garage, a reliable security complimented by the use of CCTV cameras, a gym and a swimming pool. Extra services such as POS, live band entertainment, suya spot and room service are also provided for guests. Q: Does Ree-Danielles Hotel have fitness facilities? A: Yes, a gym is available for guests to use. Q: Is there an event hall at the Ree-Danielles Hotel? A: The Ree-Danielles hotel has a well-furnished event hall for hosting different kinds of events. Q: Does Ree-Danielles Hotel have a Restaurant? A: Ree-Danielles offers a restaurant that provides a menu of great tasting dishes. Q: Is there enough vehicle parking space at Ree-Danielles hotel? A: There is. Ree-Danielles Hotel has ample car parking space and a parking garage. Q: Does Ree-Danielles Hotel have onsite parking? Is it free? A: Yes, it has an adequate car parking space. Ree-Danielles is a budget hotel in Ojota, Lagos. Everything was excellent. The environment was clean, and room comfortable. They were security conscious; services provided were great and very easily accessible. My stay was splendid. Service was by far the best part of our stay here. The staff are excellent. The breakfast was also very good. Great variety of food. Rooms were very clean and comfortable. Super fast internet was a bonus. Wish we had stayed longer here. The check in and checkout was super smooth. The hotel rooms are fantastic and done up beautifully. Small gestures by the staff make the stay truly special. The service was excellent and everyone was polite, I just had a little issue with the bathroom facilities but it was fixed. I would definitely visit again. My stay at the hotel was just alright. My check in and check out went seamless. The environment was cool and quiet. The customer services was good. The facilities worked well and the room was well cleaned. I had no problem with the hotel. The facilities commensurate with the price. It was a brief and nice stay. It was a short stay but good, I got to the hotel late because there was serious traffic from the airport but my room was still reserve for me. the receptionist was great and really nice, the food I ate was fresh and delicious too. Your hotel is doing a great job. Have nice pictures of Ree-Danielles?